This was a long, busy, work day. We met Jamie, our sales rep at 0930 and she took us to a nearly completed home of the model we chose. It helped to walk around in it and think about the floor plan. This is the kitchen. We opted to have a curved countertop on the family-room side. We spent a long time going from room to room and talking about what we liked and what we might want to change, subject to budget limitations, of course. Then we went to the lot we had selected from a map. It is on a crook in the golf course, between a green for one hole and the and tees for the next. We were happy to see the grove of trees that will be right behind our house. Then it was lunch time. We met a couple looking at the neighborhood for the first time and another couple who live here. They invited us to visit them after our day in the design center. There were many options for everything in a house. There were a limited number of “standard” options that would not cost extra. There were many more options that could cost a boat-load of money. I’m sure we’ll end up cutting corners to meet our budget. But here are some of the selections we made. The outside will be gray with white trim and a dark gray door. The house is a lighter gray in real life and the white is whiter. There is another, lighter option on the roof color; we may switch. This is the bathroom countertop and faucet color. 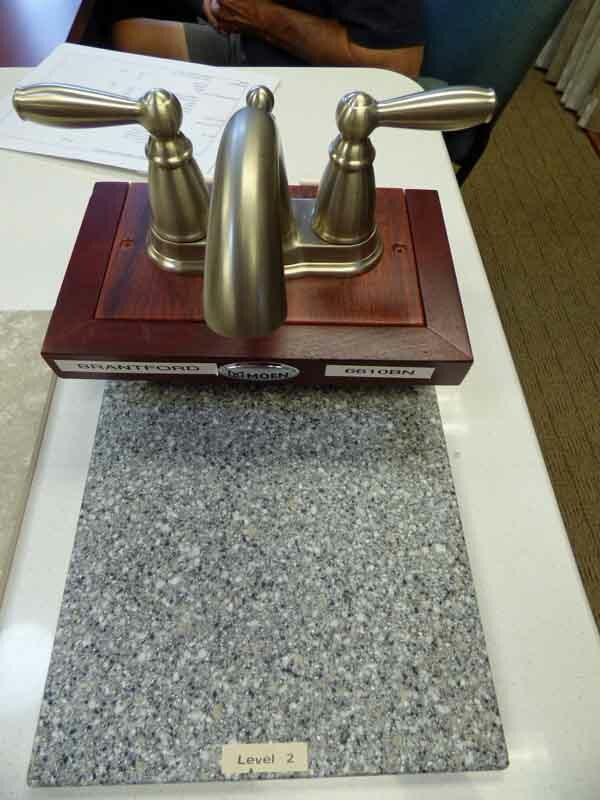 Our chosen faucet will have three pieces with no base plate. They will be farther apart and, therefore, easier to clean. The standard from bathroom countertops is Corian. We only made a slight upgrade, sticking with the Corian rather than going with marble or granite or whatever other exotic materials they had for even more money. 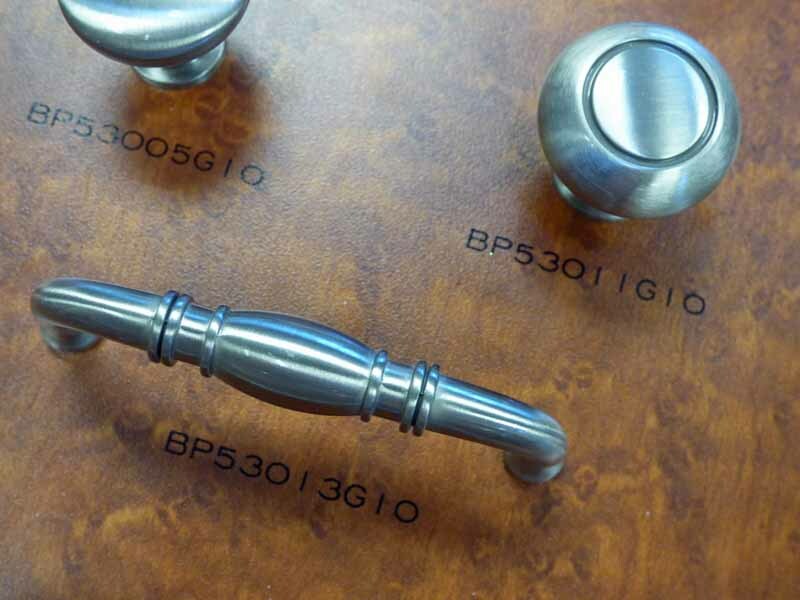 Bathroom cabinet hardware is the same as the kitchen, but a different color. I had to choose an upgrade to get white kitchen cabinets. I am still wavering about the floor tiles. The light gray on the left is too close to the cabinet color. The darker tile on the right is too brown, I think. They are both called gray. The wall color is the left, gray in a frame. Then the white cabinets and charcoal countertop. The tiles in the foreground are for the wall behind the stove, counter to cabinet level. And so it went. Light fixtures, door knobs, and more. When we were done for the day, we stopped in to visit Mary and Terry. What luck! Their house had the same exterior colors that we had chosen. We could see it live. They also had the same light gray interior walls. She had white kitchen cabinets. Seeing it all life-sized confirmed my decisions for me. She had upgraded the countertops and had something more like I had in mind, but was not willing to pay for. We stayed for a while and really enjoyed our visit. They are our first new neighbor friends in the community. Back at our AirBnB, I read bedtime stories to the two little girls. (The Cat in the Hat again) They are so sweet; it makes me miss Owen and Cam all the more. Best wishes for making the upgrades vs. budget choices! Weâve been there. Some things we would have done differently if we could reverse time. But our house is way live-able. And we are making changes/improvements as we can. The main thing (at least for us) is that the house is comfortable and functional. Today, they costed out all the options. Now we can prioritize and cut to meet the budget. My first priority was to eliminate carpeting. I’m not the best housekeeper and hate to vacuum. Second priority was to add some windows. I think we are going to get here without too much sacrifice. I guess I get the first four suggestions. 1. Choose a lighter roof shingle color. Reflecting more sunlight will heat up the attic less. We started with a dark shake roof that has mercifully lightened with age. I added two attic ventilation fans and the house is much cooler. 2. Check stain resistance with granite and marble. I understand you can add some coating or treatment so that the food stains don’t soak in, but Corian synthetic might be the best choice for ease of care. 3. Check inside of the cabinets. Are they light colored? Ours are dark brown inside and it is very difficult to find things in back. Maybe you can have them painted. 4. Buy an industrial-strength paper shredder (Ollie North model) and get rid of papers before they spread around your new home. I have been scanning might-be-important ones before shredding. Yes, I switched to the whitest roof today. 2. The granite gets a coating treatment once a year. 3. The cabinets have maple doors, but we did not see the insides. 4. You are right. Paper is the enemy of tidiness. Stick with the Corian, you”ll love it. Ours looked new 25 years later. No chips, no stains just clean and wonderful. Love your hardware choices too. 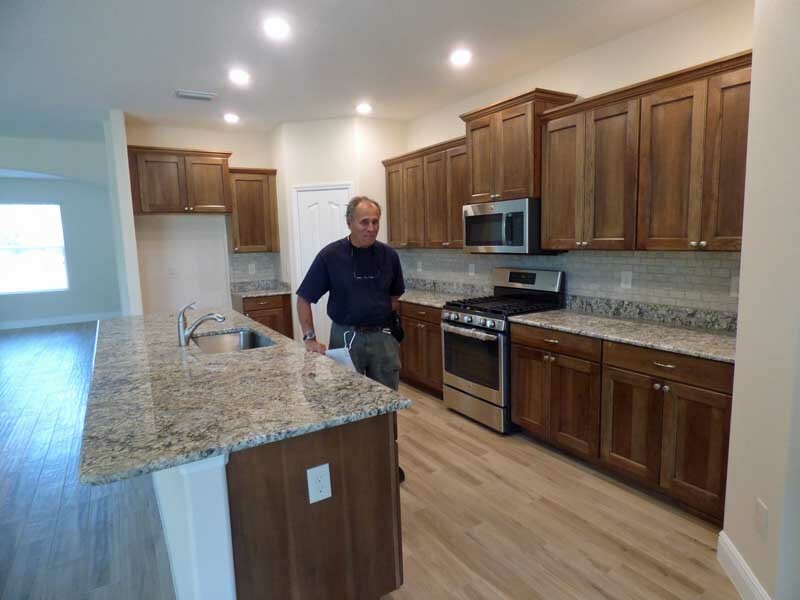 I opted for the granite kitchen counter since it is standard. The bathrooms are Corian. I am perfectly happy with Corian too. That’s what I have in the motorhome. It will be a big change, but I still hope to wander some of the time. Looks beautiful. It is so difficult to make all the decisions. Just enjoy and don’t stress over it to much. We built a house when I was 20-30. All the choices were overwhelming. This process was actually much simpler. All the choices were in a room. 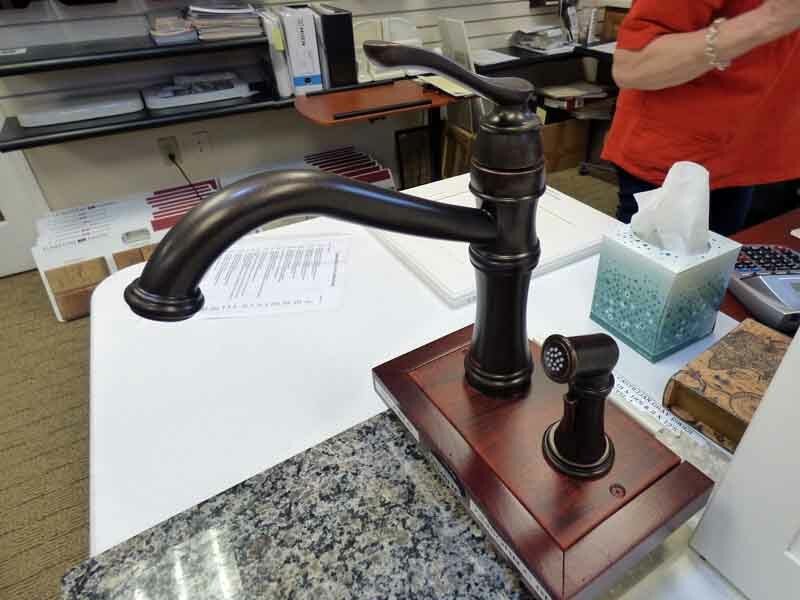 “Here are the four faucets that come with the house. You want one of those other ones, pay more.” Makes it easy to pick the standard items. They are all attractive really. It was just a matter of picking the one I liked best for this house. We are all done in two days. That’s how we were in our last house. We didn’t want the bother of upgrading or redecorating. The buyers did it after we left. I guess we have similar tastes too. The amazing thing, to me, was how they have the “process” finely tuned. They went through their checklist and covered everything that we needed to choose. It was so easy. I did have my gray/white color scheme in mind before we went in though, so that helped. And, it was hilarious that we went to vist the new neighbors and they had the same choices; even the front door. That little confirmation made be feel better. It looked too “modern” to me. I wanted a (albiet “faux”) country look. Yes, I think that looks more “country”. What a great way to help you design your dream home. Hope all your choices turn out perfect. It was a great way! It is a wonderful business model. 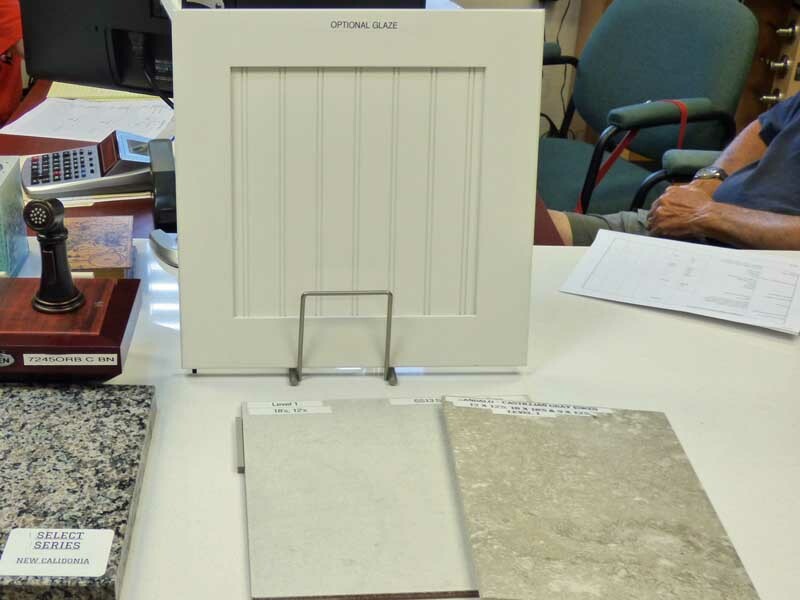 We get to choose the options we want and they get some deposit money up front for the build. Everyone we’ve talked to in the neighborhood is very happy with the result. Yes it was easy – and fun.